Black pepper fruits are the source of one of the world's most widely and frequently used spices. 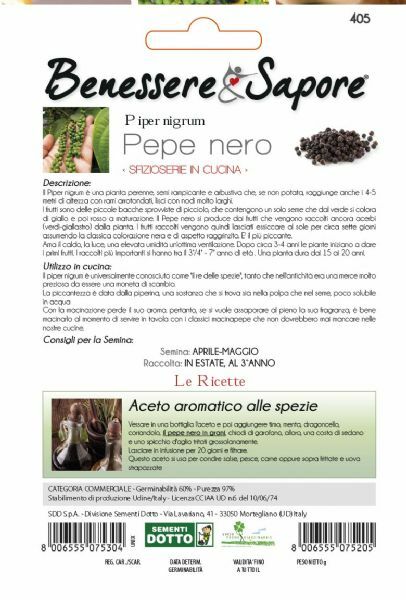 Black, white and green peppercorns all come from Piper nigrum and are popularly used as a hot and pungent spice for flavouring food. Black pepper is also used in traditional medicine, particularly for digestive ailments. 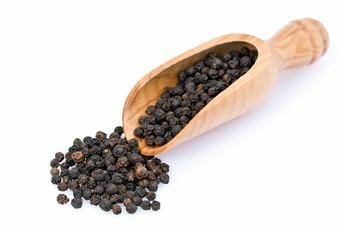 The term peppercorn rent is derived from the high price of black pepper during the Middle Ages in Europe, where it was accepted in lieu of money or as a dowry. Today this term means exactly the opposite - virtually free! Black peppercorns feature as remedies in Ayurveda, Siddha and Unani medicine in South Asia. They are most frequently used as an appetizer and to treat problems associated with the digestive system, particularly to eradicate parasitic worms. 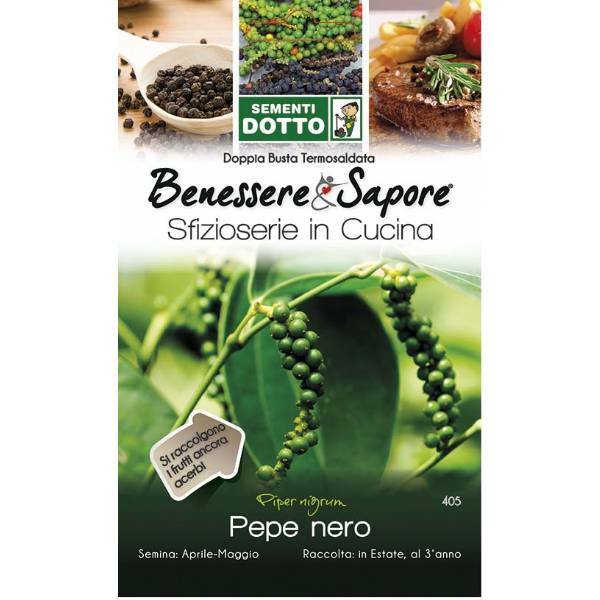 Some traditional uses of black pepper are supported by scientific evidence. 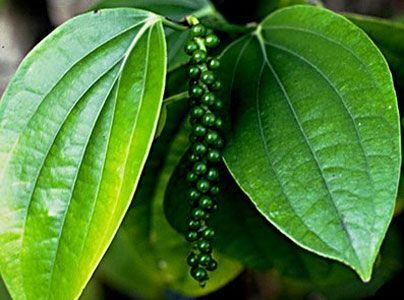 Black pepper has been prepared in tablet form as a remedy for cholera and syphilis, sometimes combined with other substances. It has also been used in tooth powder for toothache, and an infusion of black pepper has been suggested as a remedy for sore throat and hoarseness. Black pepper may be chewed to reduce throat inflammation. Externally, it has been applied as a paste to boils and to treat hair loss and some skin diseases. Oil of pepper is reputed to alleviate itching. A mixture of sesame oil and powdered black pepper has been recommended for application to areas affected by paralysis. A mixture of black pepper and honey is regarded as a remedy for night blindness. Black pepper has been given by inhalation to comatose patients. It is also believed to be useful against hepatitis, urinary and reproductive disorders. Black pepper requires rich soil, plenty of water, humid conditions, and partial shade. Plant seeds indoors ½" deep. For proper germination the seeds must be kept damp and remain at 50% humidity or higher and 75 to 85 degrees fahrenheit. After seeds have germinated, keep soil moist and from drying out. Transplant in larger pots as seedling grows. Sementi Dotto was founded in 1963 as a family-run farm specialized in the field of vegetable seeds and gardening products. SEMENTI DOTTO is present in the hobby sector with a wide range of products for gardening care and with a complete line of products for small pets. In addition, since Sementi Dotto is always heedful to changing market conditions and environmental sensitivity, with “L’Orto Biologico” line it also offers a wide range of vegetable seeds and seeds for sprouts obtained exclusively from organic farming which include the use of agricultural adjuvants not harmful to the environment. The primary objective of the company is to achieve total quality, entering the market with high-grade products, advanced packaging, cutting-edge logistics services, promotional activities, careful and qualified customer service, efficient internal processes, maintaining the balance of a large organization without sacrificing the traditional quality values for which it is famous.